It was one of those completely unexpected “quick – rearrange everything” opportunities. Colleagues at Pavilion Dance South West informed me that John Berkavitch and his company were due to be in residence the following week, and that they were looking for emerging artists to shadow them; artists working in dance and spoken word. Enter Broken Rose. Berkavitch was rehearsing “SHAME”, a breakdance and spoken word show, based on the true stories of things that Berkatich is most ashamed of. It is both hilarious and heartwrenching, and it was great to see how this particular company work together to put such a show on it’s feet. We spent a lot of time running the show, finding the holes and filling them in, and reworking choreography that was looking too messy, or that there simply wasn’t enough time to execute. 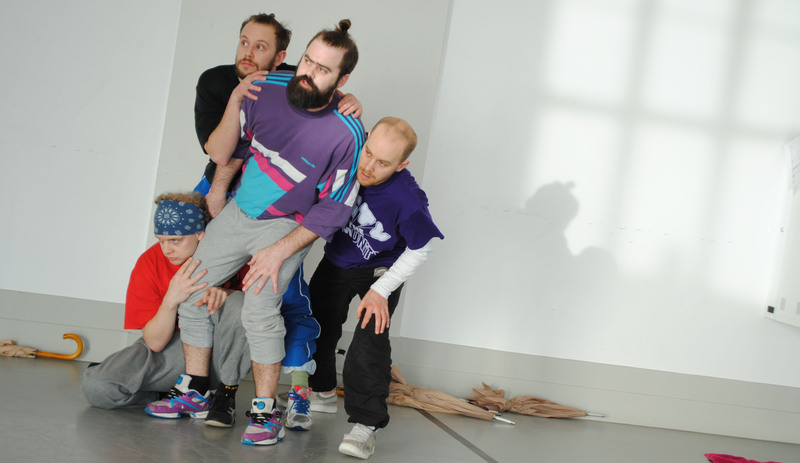 The performance is ambitious, combining so many words and movements in one package. But the company were also interested in finding out a little bit more about their shadowers. Berkavitch asks each of his shadowers to do a “show and tell”. I got talking to the company about Flow! #3, which was coming up the following week. They seemed to be rather intrigued by the concept. Luckily, I wasn’t the only shadower. Spoken word artist Toby De Angeli joined me, and the company challenged us to perform an impromtu Flow! performance. It was great working with Toby – his spoken word is interesting and plays with fast rhythms. You can watch what we created, on the spot, here. Toby is hoping to take part in future incarnations of Flow! so watch this space.